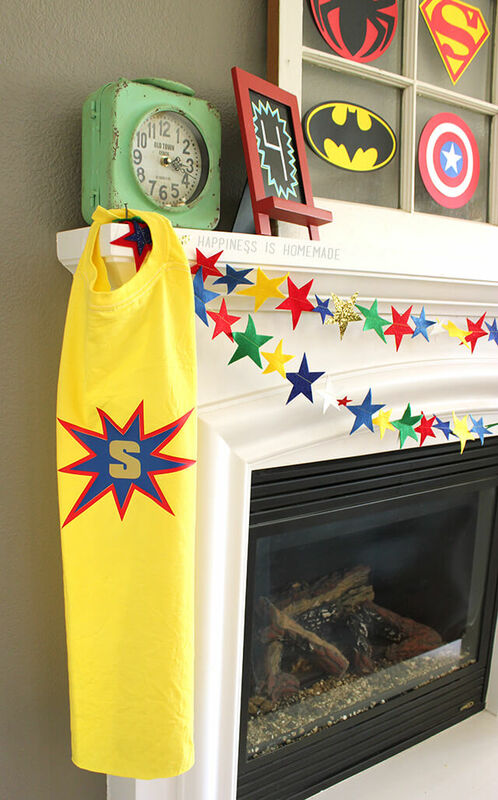 Simon’s superhero birthday party was a huge success, and some of my favorite features were the custom party favors for the guests. 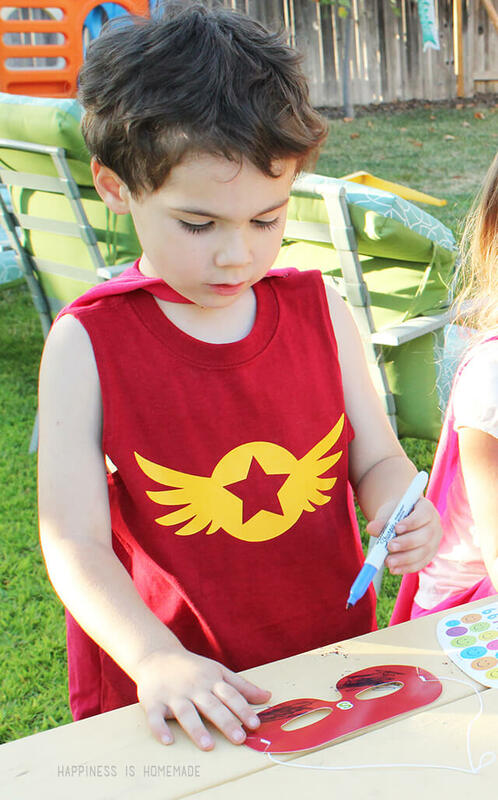 These DIY superhero capes made a big impression, but they were super simple to make – all it took was a few t-shirts and some heat transfer vinyl! 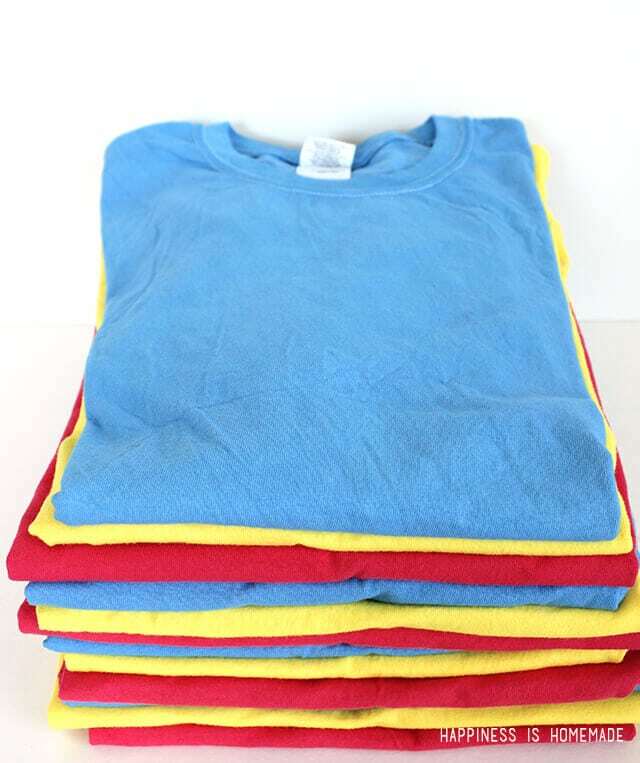 I started with a stack of white t-shirts in mens size large , and I dyed them red, blue and yellow in my washing machine with iDye. 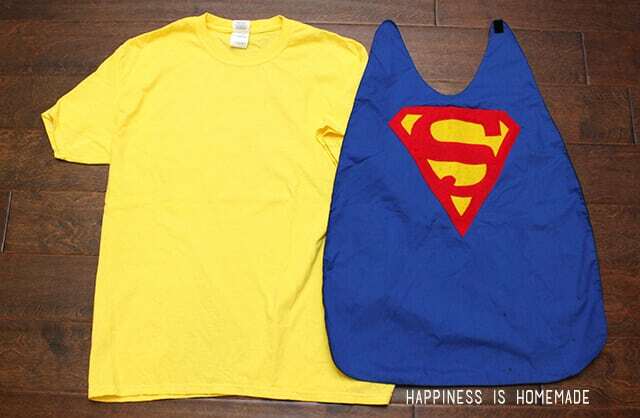 Simon has a Superman cape that fits him perfectly, so I used it to create a template for cutting out the t-shirt capes. 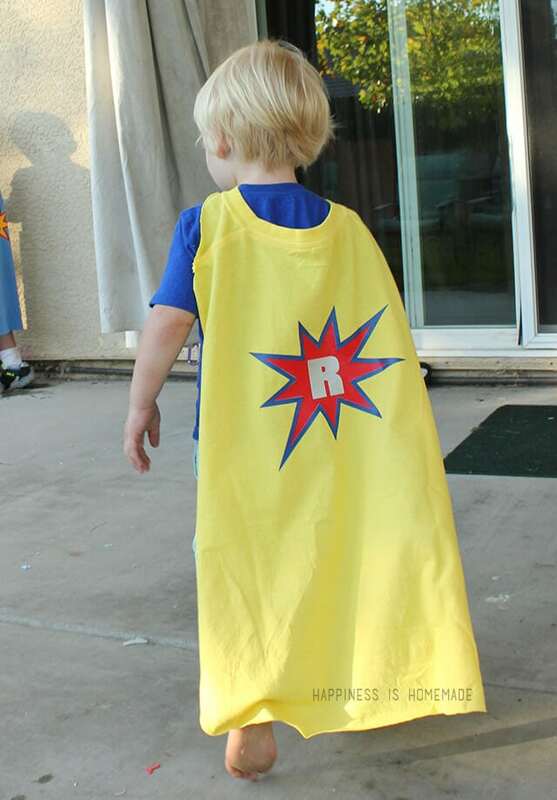 You can also use a large piece of paper to create the template if you don’t happen to have another cape handy. 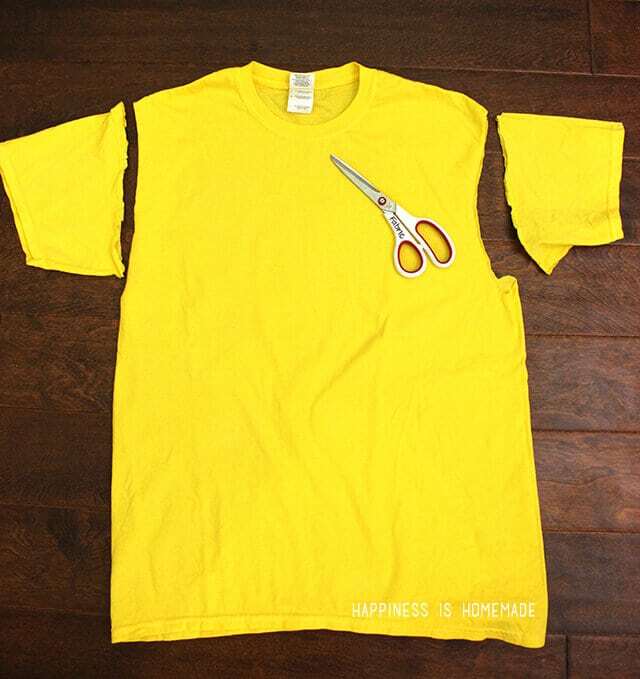 Begin by cutting off the sleeves and cutting open both side seams. 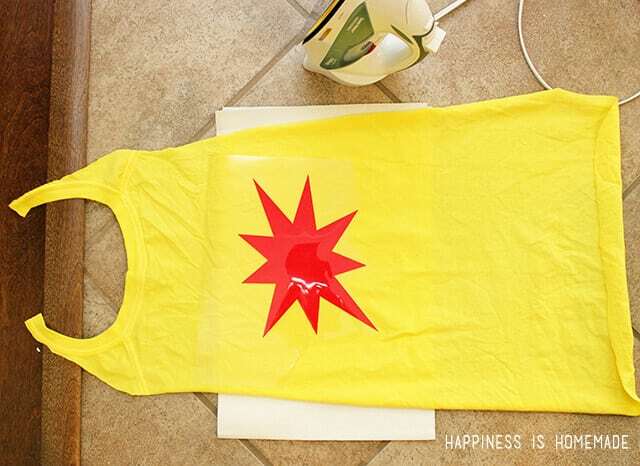 Open up the shirt, and use the template to cut the cape from the back side of the shirt. Keep the original neckline of the shirt intact to create the neck ties. You can use the neckline as-is, but I cut mine in half and applied snaps at both ends for closure (Velcro would also work well). Ta da! 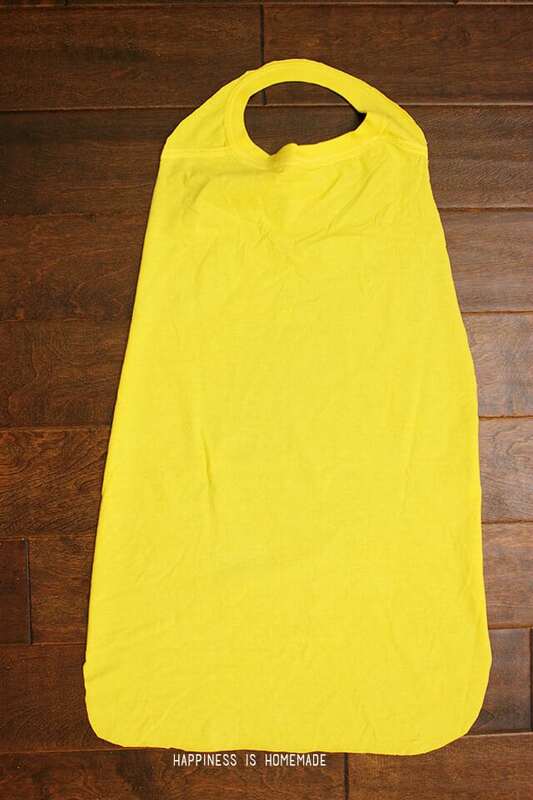 Because the t-shirt is a knit fabric, the edges will not fray, but will roll slightly to create a mock hem all around the edges. 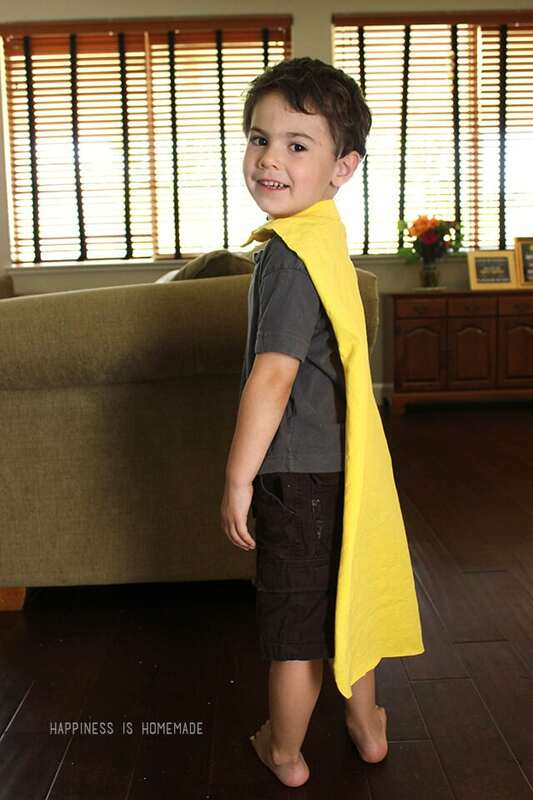 I had Simon try on the cape to make sure that it wasn’t too long, and made a few tiny adjustments to the length. I personalized the capes by layering heat transfer vinyl with the same technique that I used on my custom sports team jersey. 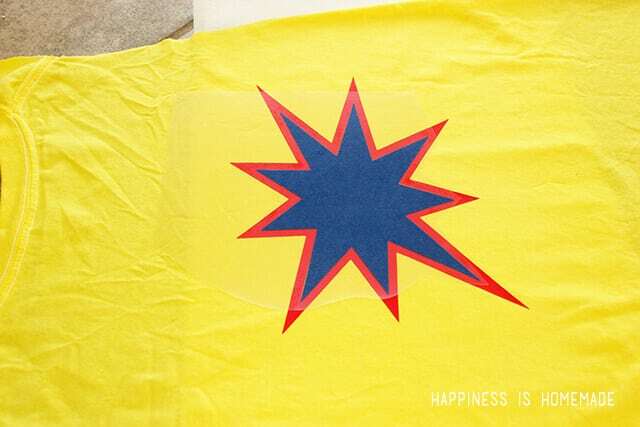 I layered two contrasting colors of heat transfer vinyl in a starburst pattern. I added the child’s initial for the finishing touch. 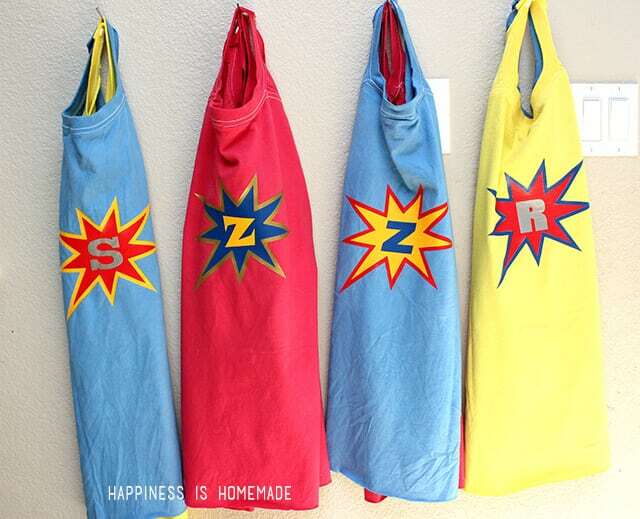 At our party we had two Zs, an R, a V and four Ss, so I made sure that each of the cape and vinyl color combinations and fonts were unique. All lined up and ready to party! 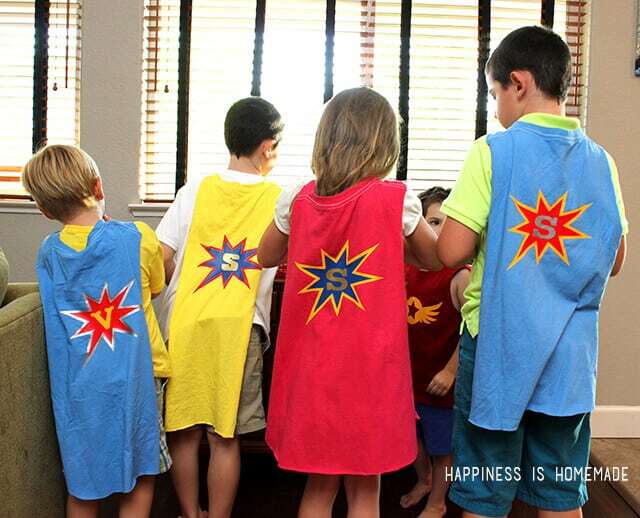 The capes were a huge hit, and the kids loved their personalized party favors! Here you can see that the original length from the size large t-shirts worked well for kids ranging in size from size 4t to 12. It was a little long for this tiny guy, but he loved it anyway! 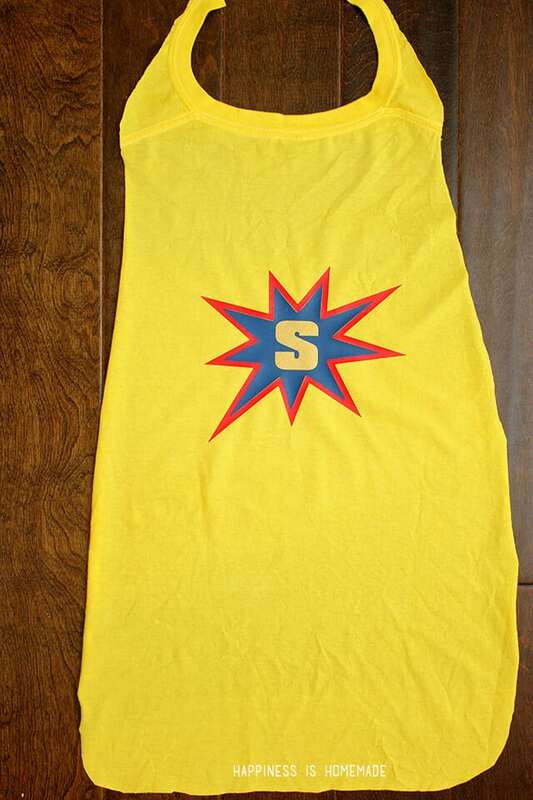 I also used a scrap of the leftover vinyl to make the birthday boy a special superhero shirt. Thank you to Expressions Vinyl for supplying us with the heat transfer vinyl to make this fun craft! 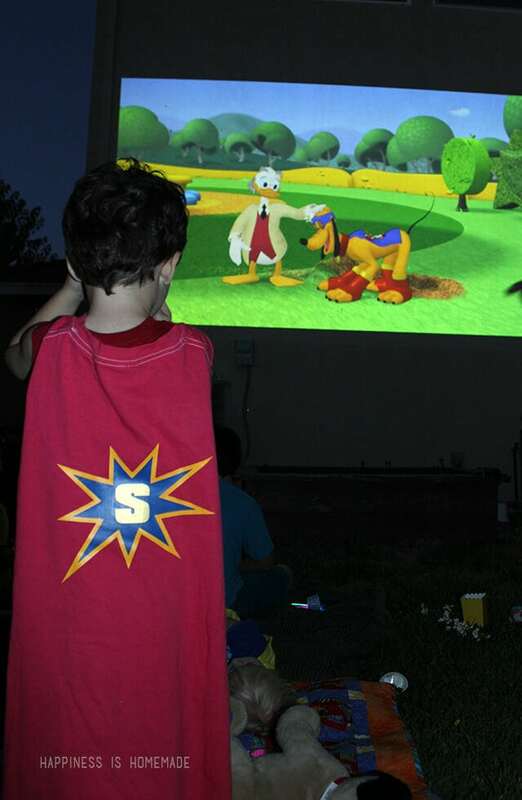 The kids wore them all the way through the party, during the backyard movie night, and up until bedtime! Disclaimer: Expressions Vinyl provided me with the heat transfer vinyl necessary for this project; however, all opinions expressed are my own! I was on this article before, but I had just skimmed over it and didn’t realize you made this with just shirts! I’m one of those people that loves to make costumes from things laying around the house, and this one never came to me. 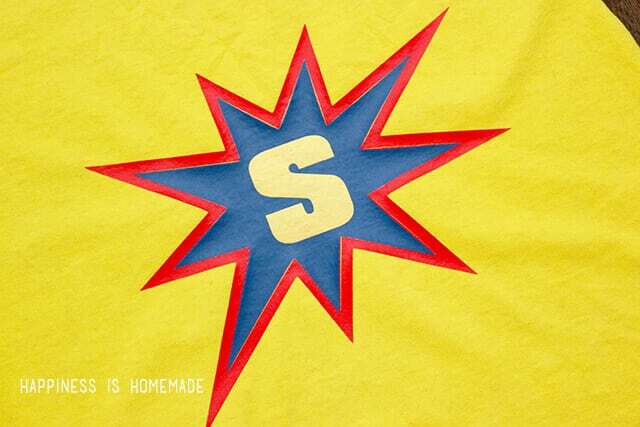 You can probably get a custom t-shirt made with the logo you want on the cape. That would save you a little hassle. You could also go to a thrift store and find colored shirts for cheap. And maybe if you’re lucky you’ll find one with a super hero logo already on it. I love this idea, though I don’t think my 5 year old princess would go for it. Oh wow. This is the best thing I’ve seen in quite some time. My little ones are going to go crazy over this. 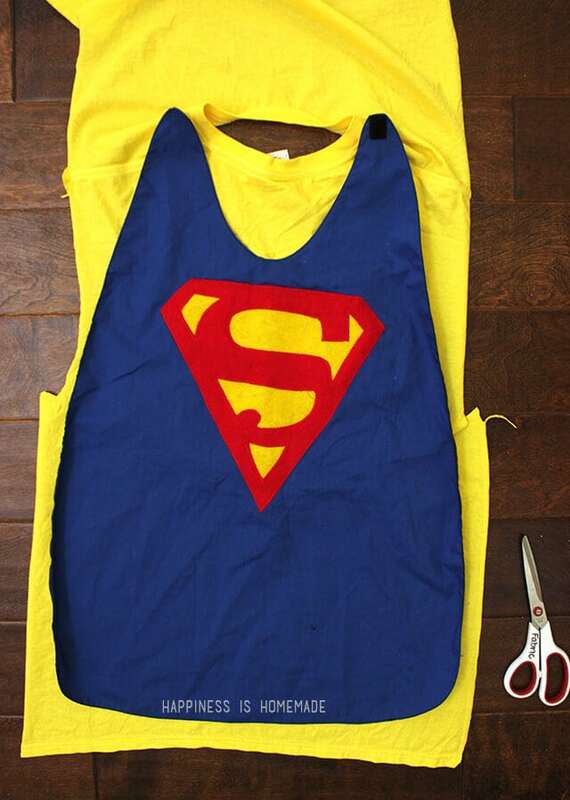 I will be making several of these capes this afternoon. Thanks so much! This is so cute and super easy! Thanks for sharing!